What Are PowerPoint Slide Layouts and Placeholders All About? 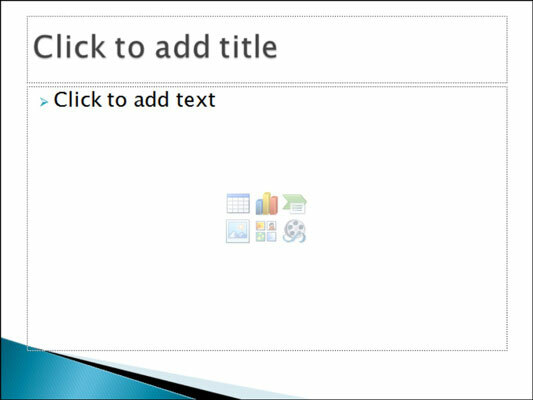 A Microsoft PowerPoint slide layout is a combination of one or more content placeholders. For example, the default slide layout — Title and Content — has two boxes: a text box at the top for the slide’s title, and one multipurpose content placeholder in the middle that you can use for text, a graphic, or any of several other content types. Some placeholders are specifically for text. For example, the placeholder for each slide’s title is text-only. Click in such a placeholder and type the text you want. A content placeholder, such as the large placeholder on the default layout, can hold any one type of content: text, table, chart, SmartArt graphic, picture, clip art, or media clip (video or sound). To add text to a content placeholder, click the Click to Add Text area and type what you want. To add any other type of content, click the icon in the placeholder for the type you want. Use placeholders whenever possible rather than manually placing content on a slide. If you change the presentation’s design, any content in placeholders is automatically shifted and reformatted to match the new design.